Doi Luang Chiang Dao maintains its reputation amongst Thai and foreign tourists who travel there to enjoy spectacular rare highland flowers, diverse birds and a number of treks. Why Doi Luang Chiang Dao is special ? Doi Luang Chiang Dao is the third highest mountain in Thailand after Doi Inthanon and Doi Pa Hom Pok. It is well-known amongst Thai and foreign tourists who travel there yearly to challenge its peak, an exercise to cultivate one’s body and mind. Doi Luang Chiang Dao, located in the Chiang Dao District of Chiang Mai, is a 2.225 meters high limestone mountain and comes under the Wild Animals Protection Area. It is one of Thailand’s many wonders, a complex ensemble of mountain peaks that are an important water source to the local people and home to rare and endemic flora and fauna. Thanks to the area’s fertile forest, Doi Luang Chiang Dao has more than 1.700 different species of fauna, including 160 varieties of mammals, 78 kinds of reptiles, 105 kinds of butterflies, 203 kinds of birds and 36 kinds of fish. 50 million years ago this area was covered by the sea. Sediments started to deposit on the sea floor; they piled up and compressed to eventually emerge from the sea as mountains. What to explore at Doi Luang Chiang Dao? The rock texture is white-grey which come from sediment piling up which are formed with limestone. It is known that the Doi Luang Chiang Dao area was once a shallow sea.If looked at from aerial photographs, you will see the mountain ridge of Doi Luang Chiang Dao is horseshoe shaped encirclement. In the center is a narrow valley and around the line of the mountain is a sharp stone with chasms, and cracks which come from the chemical reaction of rain and limestone. There is a ravine called Ao Salung. At the top of Doi Chiang Dao and Kiw Lom are two beautiful viewpoints to see the mountain mist on Doi Luang Chiang Dao. The best time to come is in the morning at the top of Doi Chiang Dao and then go to see the mist at Kie Lom another day. 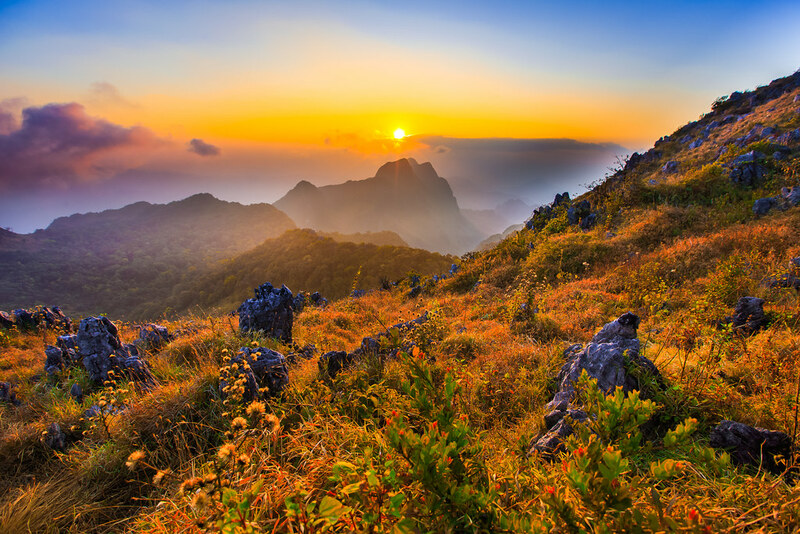 To reach the top of Doi Chiang Dao, it takes about 30-45 minutes walking from Ao Salung, the camp point, to the top. It is the best point to see the mist in the morning because on the top you can see a 360-degree panoramic view. At the east, is Kiw Lom, at the west it is Doi Sampeenong, at the south it is Southern Kiw Lom and at the north you will see Doi Pyramid and other ranges of small hills. The area at the top of the mountain has a path along which various plant can be seen. In March-April, the white roses will be in full blossom on the top of the mountain. And there are many kinds of beautiful birds for bird-lovers to photograph. Doi Luang Chiang Dao is beautiful for the changeable color of the surrounding grassland, but there are also various forest flowers and rare birds to observe all along the way. Not only semi-alpine plant communities and the view of beautiful mountain mist there also is tourist attractions and activities in the area of the national park and the nearby area. Chiang Dao cave is recommended for a visit. There are three possible routes once inside the cave complex. Phra Non cave, Kaew cave and Meud and Mah cave. All these caves have beautiful stalactite and stalagmites. The other interesting places are Sri Sawal waterfall and Pong Ang hot spring. How to get to Doi Luang Chiang Dao? Doi Chiang Dao is located in the area of Doi Luang Chiang Dao wild life sanctuary, about 5 kilometers from the town of Chiang Dao, which is about 75 kilometers from Chiang Mai. From Chiang Mai downtown, take highway no. 107 (Chiang Mai-Fang) through Mae Rim district, Mae Malai market. Keep driving for about 30 kilometers and at 72 kilometers you will find the intersection, turn left along the way to Chiang Dao district, Muang Kong to Ban Chiang Dao cave for 5 kilometers and then turn left again along the way to Pha Plong cave temple for about 300 meters. Then, you will arrive at Doi Luang Chiang Dao wild life sanctuary. Beautiful! Worth the trek up! You can take advantage of the 3 camping areas in Doi Luang Chiang Dao for longer stays in the park. There are no tourist facilities on Chiang Dao Mountain. Visitors must bring their own sleeping bags, food, and water. You will not have a chance to shower until get back and try to save your water until you get down. Always be prepared for especially cool and windy temperatures on and near the summit of Doi Chiang Dao. Lighting fires or singing songs might disturb the local fauna and are forbidden activities inside the park. Only a maximum of 200 visitors are allowed in a day. Chaingdoa is meaning to 'touch the stars' and not so hard for new trekking. The best of here are the original alpine pants; flowers can found only here and different in each months. Best time for flowers are the end of October &amp; November for all flowers I sent you in last mail.For January would be great for 'forest white rose' if the climate change not impact so much. I cannot give any word to promise about nature works. I was there once in January but not good time for 'white roses', Anyway right time is mean how you have 'luck' in your pocket. 4 times of me there was never repeat experience. Same trek gave me so various experience each time.The great time for sleeping under a millions star. Please note, there is no proper toilet, you will face of 'natural' toilet and no need to prepare for shower. You will not have a chance to shower until get back and try to save your water until you get down. If seeing the first of everything,counts in your schedule,than give this a miss! 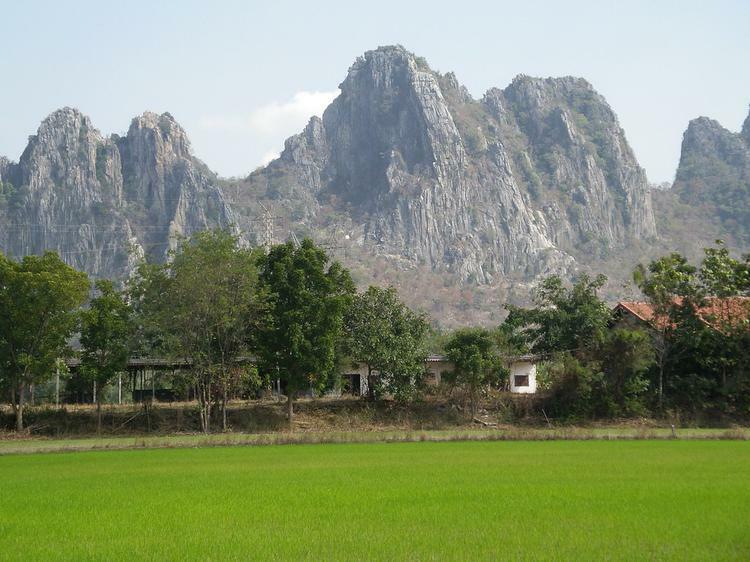 For this 2195 m mountain is the third largest in Thailand and home to the stars of the area...the Lisu and Karen villages.This peak is rugged limestone scenery with dense teak forests. We enjoy to walk in isolation and natural beauty.Try it,yourself. The rewards are instant and gratifying.Under this mountain is an extensive network of caves housing Buddhas left behind by pilgrims from Myanmar. But its the huge stalactites and stalagmites that draw you here and they don't disappoint. Take a tour which will convey you along an illuminated walkway. Great if you have young sprogs with you.Further attraction,is the elephant training camp nearby. take a jacket with you as the caves and the outside elements can change within minutes.